I’ve never had much affection for the desert. Jimmy and I both easily criticize it. However, neither of us have seen a desert quite like Sedona. I’m certain that much of our admiration of this beautiful place has to do with the time of the year we’re visiting. Spring has to be this little of bit of desert’s magical time of the year. Not only do the reds in the rock and soil seem to just burst, and the greens are still green not sun burnt brown, but wildflowers are everywhere. …wear appropriate shoes when exploring the desert. Yes, despite my thoughtful footing, I still managed to get one of those cactus needles stuck in my foot. I took this photo after the fact to remind myself of my stupidity. Many of the rock formations in Sedona are named by what they resemble, like Coffee Pot Rock, Chimney Rock and even Snoopy Rock. While we don’t know the actual name of this rock, you can imagine what we nicknamed it. Today, we traveled by car, staying on pavement rather than brave the dirty bumpy roads. We decided to go to Montezuma Castle National Monument. The Sinagua people built this dwelling in the early 1100s and lived here till the 1400s. It’s built about 100 feet above the ground. It has 5 levels, about 20 rooms and housed around 35 people. Several more Sinagua people lived in other homes built within this mountain, but most of the ruins have been destroyed. I encourage you to click on any of the links above to learn more. For as long as I can remember, I’ve felt a connection to Native Americans, so for me to merely say this was an awesome place would be an understatement. Later in the afternoon on our way back to Sedona, we stopped for a quick geocache. 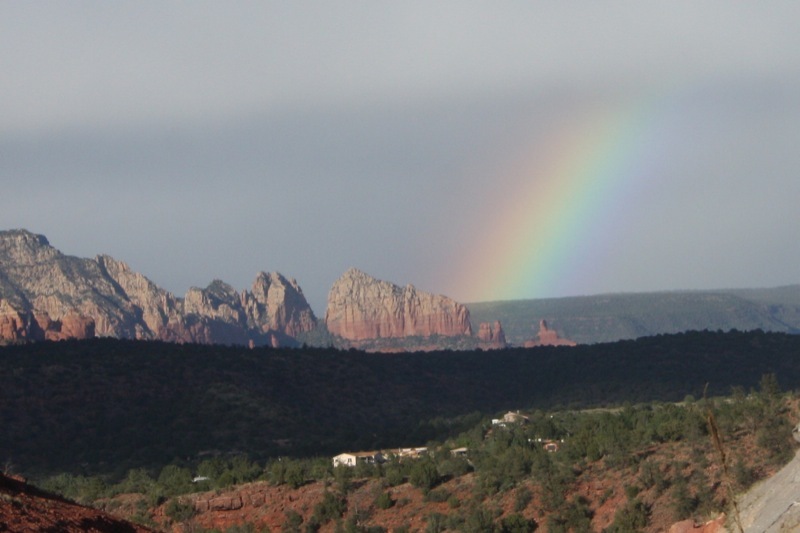 and saw beautiful rainbow with the pot of gold leading right into Sedona. and end the day sunkissed, happy and feeling blessed. Totally awesome, Mad! That place is just pure magic, I know. So glad you were able to capture it in all its glory. I am amazed by the dwelling created in the rock. How genius and laborious. This is really lovely! And Imagine all those people living in the dwellings high up in the cliff! Makes you wonder how they got to the nearest supermarket for their groceries doesn't it??? P.S. flip flops?! shaking finger at you!! very nice photo series with a great sunset for a perfect ending! I'm going backwards, but these photos are gorgeous too! How cool to see the rainbow. that's a lovely area. My friend has recently scrapbooked the area. It was where her mom wanted her ashes spread. Very special place. I love the cliff dwellings. It made think, 1100, that's about when those Viking ships were sailing around Scandanavia, conquering other lands. Interesting to think all the different things going on in the world at the same time.